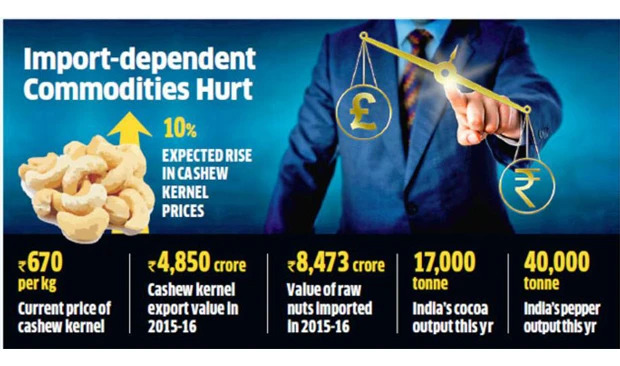 The depreciation of the rupee against the dollar following Brexit may hit import-dependent commodity export sectors like cashew, cocoa and pepper, traders and exporters said. The immediate impact would be felt on cashew industry, which has been importing more raw nuts for processing as the domestic consumption has been increasing. The proliferation of cashew processing factories in the country has raised the demand for raw nut. Earlier, cashew kernel exports and raw nut imports were more or less matched. But now, imports are considerably higher. In 2015-16 cashew kernel export value stood at Rs 4,850 crore while the country imported raw nuts worth Rs 8,473 crore. India is a large importer of cocoa products used in confectionaries. India's cocoa output of around 17,000 tonnes just meets about 30% of the requirement. Apart from big companies like Mondelez, which imports cocoa butter to make chocolates, other companies buy cocoa powder, used for products ranging from cookies to sweets. Rupee depreciation may impact these companies to a certain extent. "But several companies are importing cocoa powder free of duty from Indonesia under the Saarc agreement,'' said Renny Jacob, the managing director of Cacobean Chocolatein. Cocoa powder is used for giving brown colour to cookies, biscuits and cake products. African cocoa beans are of superior quality than Indonesian beans,but the later lends itself well for making cocoa powder. Moreover, Indonesia has also imposed export duty on cocoa beans to encourage processing industries in the country, Jacob added.